I didn't get a chance to write last night but I have to share...I cantered Ketel yesterday! He has a beautiful canter. It was tough to keep him going but it's a start. He was soo good. I ride him in a small pasture I have to keep things "in control" if need be. After I rode him I walked him out to my jump field where I ride my other horses. This was his first time out there. There is alot to look at but he did great. He didn't bat an eye at some tires I set out to spook the horses. I try to put as much stuff as I can out there to desensitize them. The only thing he looked hard at was the liverpool. He doesn't really spook, he looks hard and then his curiosity makes him want to get a closer look. I love that about him. I then got off and walked then trotted him over some poles. I also walked him along the front of out property along the fence line. I like to cool the horses out there. He handled it all well. I am so proud of him. I also rode Poppy and Tank and they were super too. I haven't jumped Tank much lately so I did some course work with him at about 3'3. He was perfect. This is what I love about him, he is so tuned and knows his job. It's nice to have a horse like that when you have greenies. Sunday the horses have off so I can get my house work done. It looks like rain all week so hopefully I can get some riding in. I am taking Poppy to a local show on Saturday to get some practice in. So here is hoping for a rain free week! I wanted to watch round 2 of the World Cup in Sweden soooo bad today. It was live streamed on FEI Network but I'm not a member and really didn't want to join. 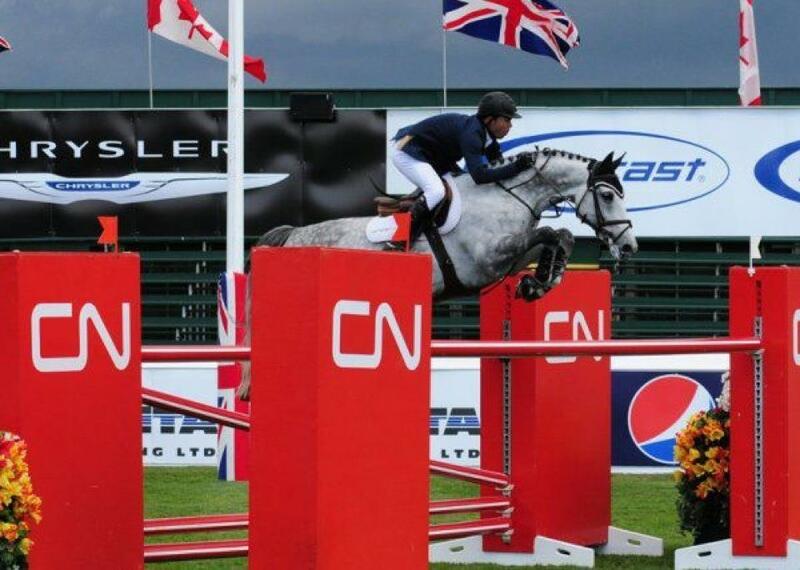 I absolutely LOVE Kent Farrington's horse Uceko. His nickname is "Little Grey" and he just reminds me so much of Poppy. Kent and Uceko had a rail today and are currently standing in 23rd place. My other favorite pair Rich Fellers and Flexible had a refusal yesterday and a rail today so they are currently in 29th place. Beezie Madden and Simon are currently in 2nd place. So exciting. How awesome would it be to have an American win 2 years in a row??? I don't even like eventing and I am all about Rolex. Why? Because of all the OTTB's. 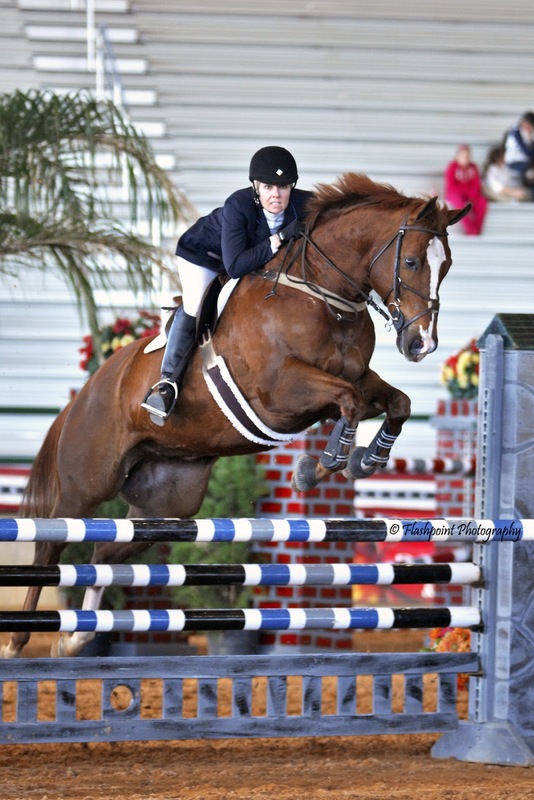 You don't see them at the top of show jumping much anymore. Not a single TB at The World Cup. Not because a TB is not capable, but because Americans like to go to Europe to find their show jumpers. But that is a post for another time...Anyway, I don't care for dressage yet I was watching it on live stream today and checking the standings regularly. Tomorrow is cross country, I will try to catch what I can but I would rather ride my horses than spend the day watching people ride online. I will be hoping for an OTTB to come out on top though. They have recently been getting all kinds of attention and a win would help the momentum to continue. So with all this excitement going on in equestrian sports how can you NOT be in the mood to ride? Plus I got Poppy a new bit that I was eager to test out. I was riding her at home in a 3 ring but it has become too much bit for her. I ride her in a Waterford at the shows which she goes really well in so I would like to keep it as her show bit and find something for home. So I bought a loose ring 3 jointed bit with a ball in tthe middle. It is similiar to the Waterford so I thought we would give it a whirl. I don't think she was fond of it but it was hard to tell so we need some more time in it. She is fussy and fidgety on the flat anyway but today it was really bad and she keep yanking the reins. But then hopping over the jumps she was fine. So I think it warrants another try. 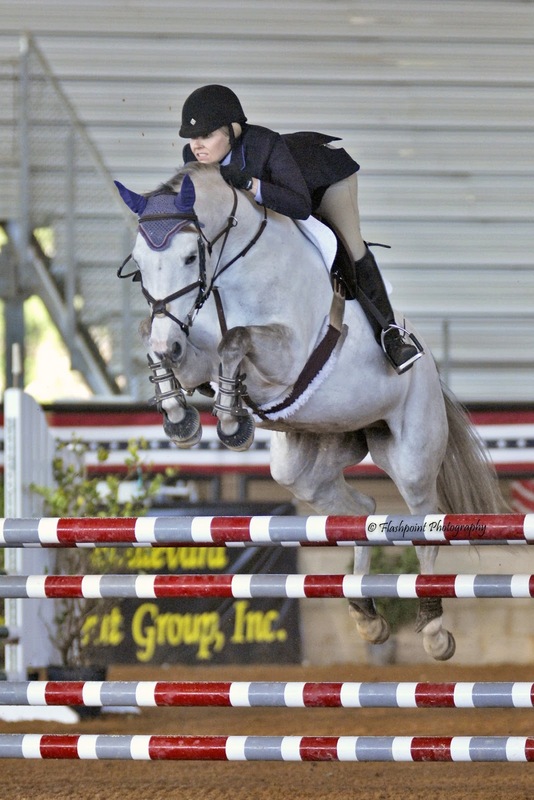 I hadn't jumped her since our show last weekend so I jumped a little bit. She was still in horse show mode and had to clear the standards. My husband built some 6 foot standards for me and all I know if that I am looking way down on them from the air! I don't like to jump my horses too much at home. It puts alot of wear and tear and them so I prefer to jump maybe 2 times per week. Usually small the first time and bigger the next. Then flat work on the other days. I'm exhausted from a long frustrating day at work. I decided to only ride one tonight and groom Ketel. It has bothered me that his mane lays on the wrong side so I braided it over on the right side. Those braids make him look so silly that I hope I can take them out Sunday. He has a thin mane so I don't think it will take long to train his mane. He is looking less like a race horse. I've had him 8 weeks tomorrow. I wish he would put more weight on but it will just take time. Hmmm, I wonder if tomorrow we will canter??????????? Tonight I first rode Tank. He has only been ridden lightly for the past couple of weeks due to my lack of time so he was a little full of himself but still a good boy. He does much better when he is ridden at least 3-4 times a week, I really need to work on getting him back in shape. We jumped a few little jumps and that was about it. It's hard to come up with fun things to break up his routine. A picture of Tank taken 2/13 but I wanted to show off how cute he is. This is at my trainer's barn. Ketel, taken a couple of weeks ago. Today I hacked Poppy for the first time since we showed on Saturday. I always like to give the horses a couple daays off after a show. She was great. We worked on counter cantering, leg yields, turning on the forehand, etc. She is getting so much more rideable and adjustable over fences. All this flat work helps. I might jump her a little Friday. We have another show May 4th so I likely won't do course work until closer to then. Next up was Ketel. Today I decided to just lunge him. Yesterday I rode him and it was the worst ride I had on him thus far. He would not respond to my leg, would not bend or turn to the right, kept breaking, kept tripping because he wouldn't pick up his feet, etc. I don't blame him, I blame myself. I had not been on him in a week so he got used to not having a job and was just being a baby. I finally decided to put him on the lunge. He stated his opinion of having to work so close to dinner time by bucking at me and being obstinant. I continued to work through it until I had some positive moments then let him be done. So today I just lunged. He was a champ. Walked, trotted, and cantered. This was the first time I got him to canter on the lunge on cue. He has a beautiful canter too! I felt so much better after this. I just really need to consistently get Ketel on my schedule. It is so challenging to do so after I get home from work. I only have time to ride 2 so someone gets left out. My goal is to focus on getting Tank sold. I enjoy working with my greenies and it is time for him to find someone that will give him all the attention and ride time that he deserves. I haven't shown him in awhile and I know he misses it. The challenge of selling horses is a whole nother blog for another time! So tonight I am going to bed exhausted and weary but so happy with all the horses tonight. It is such a great feeling after you have had a good ride! Good night! I typically don't ride on Sundays (unless there's a horse show). It's really the only day I have to clean the house, do laundry, and all those other dreadful "house chores." So hopefully my next couple of blogs will be about riding Ketel. I also need some cooperation from the weather. No more rain! So in honor of "Ketel Week" I'm sharing a picture of Ketel taken at the farm where I bought him. My first thought this morning when I woke up to the sound of pouring rain was "oh no the horses are out." Then it occurred to me that it is pouring and I have a show to go to. I reluctantly got up, got the horses in (who were pissed to be out in that yuck), fed, then proceeded to bathe Poppy. All while it poured. I checked the weather and radar showed no rain in Ocala. Good news. So off I went. Arrived and no rain yet at the show. That lasted about 10 minutes. It rained and didn't stop all day. And got cold. It was MISERABLE! My misery showed in my riding. I had some misses but Poppy was great and tried hard. We stuck with the low adult jumpers today and was 3rd in both classes. But couldn't wait to get home and warm up and dry off! I'm pretty sure Poppy felt the same. I was so frustrated with my riding yesterday! Today I decided to ride Poppy and work on lengthening her stride and getting to the jumps. She of course was great but I finally saw my distances and stopped pulling her. I have this annoying habit of when I don't see a distance I pull. I pull until we are so deep it is just ugly. Today I kicked instead of pulling. And what do you know, I saw a distance! What a concept! 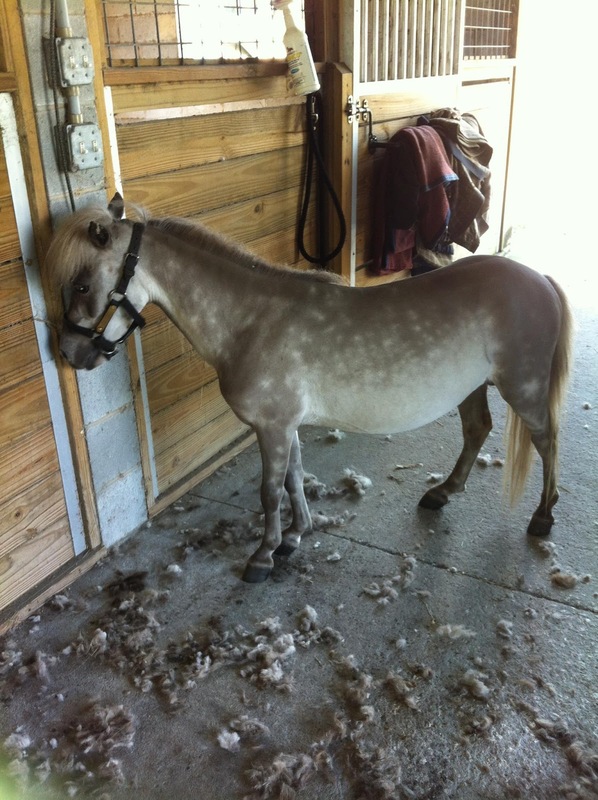 Poppy was great so I let her be done and then groomed the other horses. I will jump her a bit bigger tomorrow as we prepare to show Sat. Tomorrow will be a busy day getting the horses ridden, tack cleaned, hook of trailer, then load everything for Saturday. I keep watching the weather too, unfortunately is looks like rain on Sat. I am praying it holds off until late afternoon when I am done riding. That of course won't be my luck though. I am so in love with Ketel. He is just so sweet and well behaved. When I finished grooming him I stood about a foot from him and made kissy noises until he came to me and let me kiss his muzzle. I can't believe this guy is just turning 3 this month! He stands so quietly while I groom him or clip his muzzle. I feel bad for Tank because I haven't ridden him. I told myself I will ride him tomorrow. Today I wanted to incorporate the flat work of lengthening with Poppy into jumping. I took a pole and place it about three and a half strides from a small vertical. After flatting her and warming up over a couple of jumps I jumped the vertical to rail. The first time I just rode it to see how it went and she nailed it in 3 1/2 strides. Second time she landed and immediately put on the jets to get there in 3. My frustration is that each time after that I kept getting in deep to the vertical. I road to it every way possible and still saw the same deep distance which then made it hard to get out in 3 strides. Even Poppy was getting annoyed which meant she has some serious tail swishing going on. I ended by jumping a couple other things then finishing with this line and whoaing to fit 4 strides. I wanted to end on a good note. I think tomorrow I will just jump around and maybe come back to this Friday. Getting home from work late just left me enough time to ride one. I still pulled Ketel out and gave him some kisses and cleaned him up. He is so sweet I just want to kiss on him every time I see him! So I really need to get over today and leave it behind otherwise I will continue to miss which leads me to pulling all the way to the jump. It was a busy weekend so I am just now getting around to post about it. On Saturday I trailered Poppy to Ocala to show her at RMI's A rated show. She was such a sport getting up at 4:15 am to feed and bathe her. I can't believe we were on the road by about 6:20 am. Oh what we do for our love of horses! I decided to drop her down to the low adult jumpers. We had not shown in a couple of months and were just trailering in for the day. Our first class went ok but definitely showed we were rusty. Still came in 4th. Our next class was MUCH better and we were 2nd place. We have much to work on this week and will give it a go again next weekend. Poppy is such a trooper. She stood tied to my trailer munching on her hay while I watched my friends show and did some shopping at the tack stores. I had to get the good pony a new halter. Poor thing was so tired when we got home that as soon as she was turned out she rolled to get the clean off then settled in for a nap. The horses got a few days off and I was back at riding today. First I gave Poppy a good hack to start getting ready for the show. We worked on moving forward and lengthening. She did well so tomorrow we will incorporate that into some over fences work. Next I rode Tank. Poor guy hadn't been ridden in close to a week. I expected wild but he surprisingly was pretty quiet. A hack day for him too. I wish I had time to ride one more. Instead Ketel had some ground work. He stands quietly in the cross ties, picks up his feet, and stands still for fly spray. He is so well behaved it just surprises me daily. Horses ridden and barn chores completed by 9pm. I am starting to think that I have lost my mind having so many animals! I should probably give you some background on my horses since they are the main characters here in my blog. Poppy is a coming 8 year old grey Hanoverian mare. She is nicely bred. Her sire is Don Alfredo and is out of a mare named Eidelweiss by Aerobic. I bought her almost 2 years ago as a very green mare who was jumping cross rails and thought her job in life was to be a pasture puff so she would be naughty to get out of work with her owner. She is little is stature, standing about 15.3 however she has such a big jump in her you hardly notice. Her form over jumps is just beautiful. I just moved her up to the High Adult Jumpers (1.10/1.15m) a couple of months ago. Tank is a coming 15 year old QH/Paint. He is solid chestnut with a blaze and 3 socks. He stands at 16.2 and built like a powerhouse. He will crack your back over a decent sized oxer. 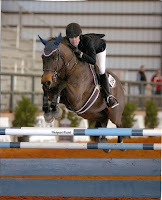 I compete with him in the High Adult Jumpers (1.10/1.15m). I bought him about 6 years ago as a greenie who had a pension for bucking people off upon landing from the jumps. After some trial and error I found he HATES people laying on his neck. The boy likes a correct position, is that too much to ask? My newest addition is Ketel. He is a coming 3 year old TB gelding. He is dark bay with just a small star. He stands at 16.1/16.2. and is still growing. I bought him March 2nd and he was 8 days out of race training at that point. He was sent down to Calder in Miami to learn to be a race horse and apparently was too slow so he went back home to Ocala. His sire is Graeme Hall and he is out of Scandals by Fortunate Prospect. What compelled me to buy him was not only his nice conformation but also his kind eye and demeanor. He is the old soul type and just sweet as can be. So far he is everything I hoped for so we will see what his future holds. Hobbs. He is my 24 year old retired jumper. He is I think about 16.1 solid bay TB with lots of grey brought on by age. 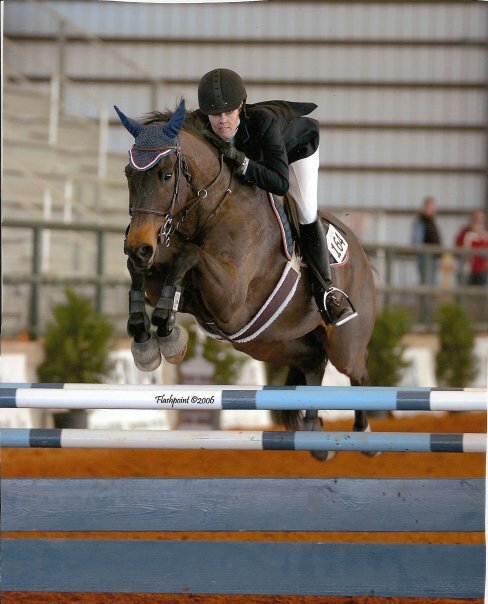 I bought him from my trainer when he was 12 and she bought him for her daughter when he was 7. He was just awesome in the High Adult Jumpers. He either won or lost trying to win. If he was clean not many could be faster. When I first bought him I fell off a lot because he turned so fast I couldn't keep up. You could never jump the same course twice because he remembered it and would go so fast and turn so tight it was just out of control. And he always celebrated after he complete a course with a victory gallop and a few leaps. This was not negotiable and I have no clue how he knew when a course was completed. He was such a competitor it has always baffled me why he never raced. He loved his job. When the buzzer sounded for the jump off you'd better hold on because he was off to win. He slept in his stall before his classes and when it was time to go he was ready. And sweet as can be. You can lead him by his forelock wherever you want. When he was 17 we had just completed several weeks of showing at Winter Series where he either won or came in 2nd when he got hurt in turn out. He played hard and he pulled something behind. We thought it was a suspensory but after treating that he still was lame. We continued to try and diagnose but never could figure it out and he was "broken bone lame" as one vet said. Eventually I gave up and retired him and he eventually became sound behind but he had nothing left to prove. He has earned it. It makes me tear up just talking about how great he was/is. Lastly and the least tallest is Cotton. He is my 4 year old miniature. He is a silver dapple that stands at about 30 inches. I bought him when he was 9 months old to babysit when I was away at shows. At the time I only had Tank and Hobbs and when I was away at shows with Tank, Hobbs would pace and scream. Now he just hangs out and pretty much does nothing. Tonight I hacked Poppy (coming 8 year old Hanovarian mare) and did a few small trot fences. My plan for her this week is to work a little each day. She felt pretty good tonight. She still is a bit resistent to bend to the right at times. When I really push her she gives in but she not as soft that direction initially. We will continue to work on this. As usually she jumped superbly. Next up was Ketel (the coming 3 year old TB gelding). I normally work him on the lunge line for a bit before I get on him. Tonight it was getting late so I took a chance and skipped the lunge. He was perfect. Still takes alot to get him moving off my leg. He likes to choose when we are done and just "park." I am working through this with him and tonight he only managed to break from the trot once. We spent about 20 minutes trotting each direction, making circles, and practicing steering. He did well and I let him be done with just a short session. Did I mention he is about 5-6 weeks off the track? He is handling his new job so well, there is no need to push him.